A 16 foot long by 48 inch diameter rotary blanching drum. USDA sanitary construction, all food grade stainless steel with fully removable screen panels. CIP spray header with 10HP Triclover pump. Hinged drum access / cleanout doors. 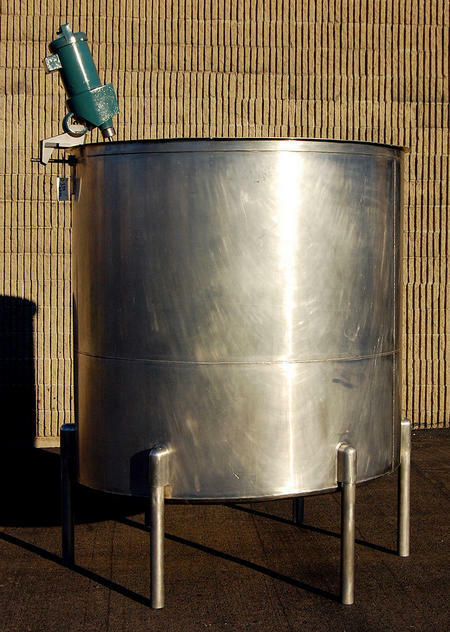 30 inch diameter round stainless steel infeed hopper at a 69 inch infeed height. Rigidized / dimpled stainless steel discharge chute at a 36 inch discharge height. 3 phase main trunnion drive. Fractional HP cover lift drive. 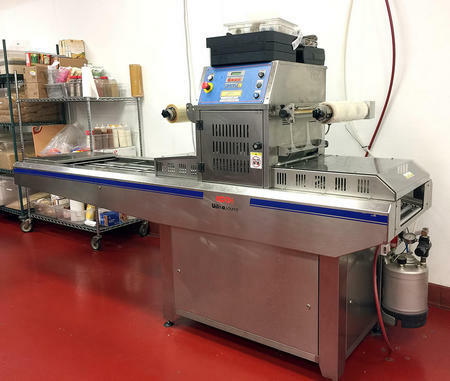 As of this writing, this fruit and vegetable blanching machine is in stock at Alard, in very good condition, available for timely shipment. A 700 gallon open top tank with Lightnin Agitator. 60 inch diameter by 60 inch deep straight sided vessel. Sloped bottom to a 3 inch diameter side bottom outlet with Tri-clamp fitting. Lightnin mixer with anchored agitator, clamp top mount, with 14 inch diameter 3 blade prop agitator; .87HP 460 volt 3 phase mixer drive. 77 inch infeed height, 14 inch discharge height on (6) stainless steel legs. 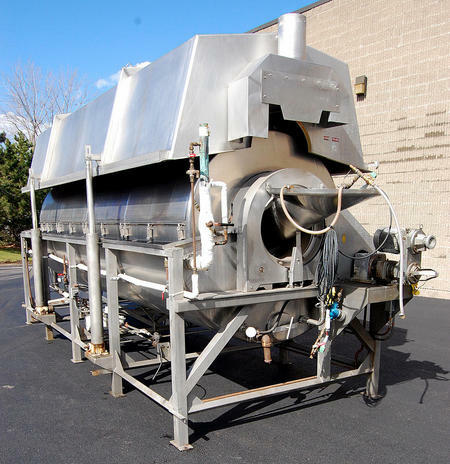 As of this writing, this food grade mix tank is in stock at Alard in very good condition, available for immediate shipment. Configured with vacuum and / or gas-flush capabilities, modified atmosphere packaging (controls can be set for operation with vacuum and gas flush, vacuum only, gas-flush only, or set for atmospheric sealing). Manufacturer rated for up to 10 cycles per minute (number of trays sealed per cycle depends on tray size, see below). Currently set up for 8 inch long by 6 1/8 inch wide by 1.25 inch deep trays sealing two trays per cycle. 1 tray per cycle: up to 15 inches (380mm) by 10.63 inches (270mm). 2 trays per cycle: up to 7.08 inches (180mm) by 10.63 inches (270mm). 3 trays per cycle: up to 4.33 inches (110mm) by 10.63 inches (270mm). 4 trays per cycle: up to 3.15 inches (080mm) by 10.63 inches (270mm). Bar flight through-conveyor does NOT utilize die plate change parts for container handling, so changeover is much faster, cheaper, and easier than other machine designs. Open infeed section for manual tray placement. Integral touchpad operator control panel. Left to right product flow from operator control position. 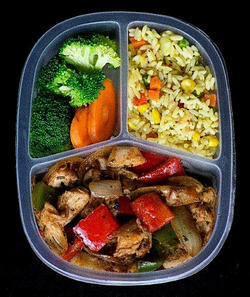 Food grade USDA sanitary all stainless steel construction. Original operator instruction manual included. 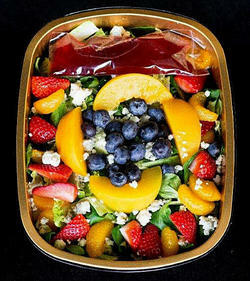 Previously used for packing salad and entre trays of fresh fruits and vegetables.